I always love ideas that turn an ordinary gift into something special for friends. Wrapping a bar of soap in pretty paper, fastening with ribbon and attaching a parcel tag immediately elevates the aesthetic of a humble soap to something superior. I have wrapped up bars of the Body Shop's mango soap which smells gorgeous, it is important to use soap you would actually like to use! I decided to stamp the word 'soap' on the tag but you could also stamp a personal message, name or quote. Any fabric or paper could create the wrapper; I would like to try music manuscripts, maps and lace in the future.....I will have to get collecting!. 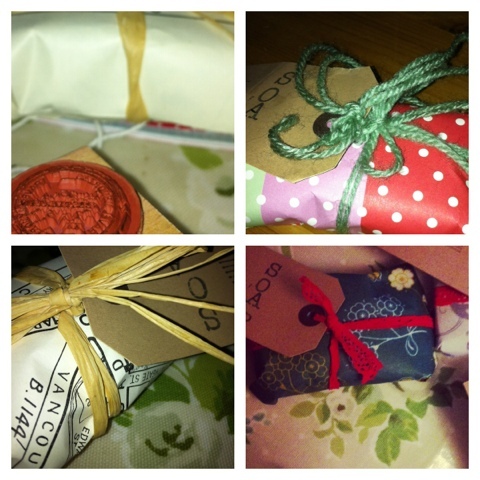 The wrapped soap could be adorned with buttons, a brooch or even dried flowers for extra detail.